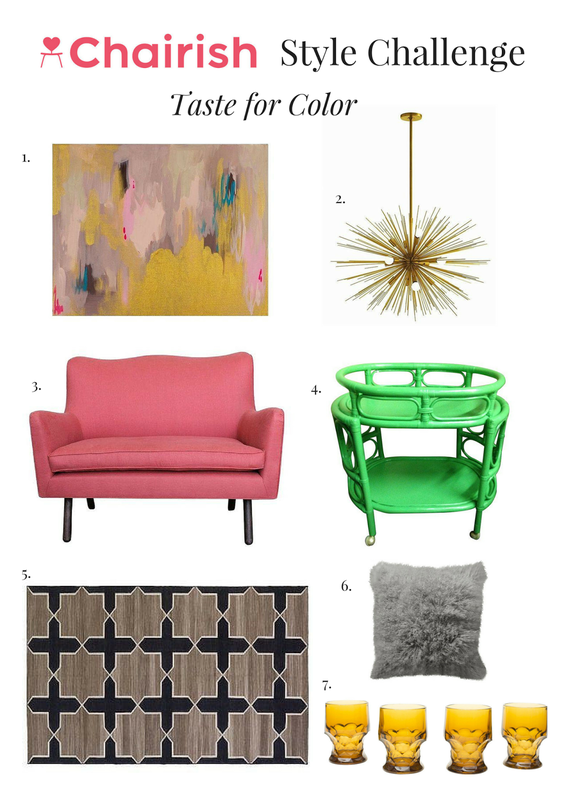 As someone who absolutely loves color I was thrilled to share my taste for color by creating a styleboard around a vintage rug from Chairish. If you haven't heard, Chairish is an exclusive, curator approved, online marketplace for vintage and used furniture. This was my first introduction to Chairish, but after browsing the site I'm completely hooked. When choosing a color palatte for a room, it can be really hard step away from the basic neutrals and incorporate some bold color. The starting point for this room was the gorgeous Madeline Weinrib graphic rug in a neutral tone. With so many amazing rugs on Chairish it was hard to narrow it down, but this pattern and color scheme was the perfect piece to take this room from white to bright. With a neutral rug I was able to add pops of color with fun accessories and contrasting colors. A contemporary settee in a bright coral color becomes the focal point for the room paired with the neutral rug, plush grey Mongolian lamb pillows and a retro starburst chandelier. Adding a bold green bar cart and mustard colored vintage glasses was a fun way to add a little contrast to the room. The playful abstract art piece ties the room together with similar hues of pink and gold. What do you think? Are you ready to take your room from white to bright?